Recourse to natural law reasoning has long been a part of how Catholics and Christians engage in debates about issues of public and private morality with people and communities of people who do not share the Catholic/Christian faith. But with the rise of modernity, the scientific revolution, and the relative success of Charles Darwin's theory of evolution, many Catholics have begun to question traditional natural law reasoning. Some, including theorists like Germain Grisez, and John Finnis have sought to modify traditional natural law reasoning and continue to employ it within debates concerning public and private ethics, while others, acknowledging the radically altered conception of nature that followed the scientific revolution have thought to look for alternative modes of engagement. 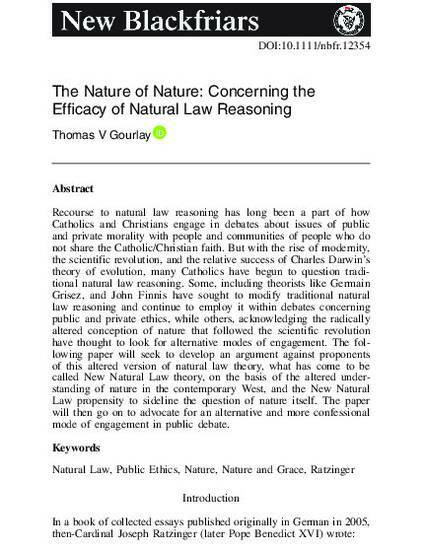 The following paper will seek to develop an argument against proponents of this altered version of natural law theory, what has come to be called New Natural Law theory, on the basis of the altered understanding of nature in the contemporary West, and the New Natural Law propensity to sideline the question of nature itself. The paper will then go on to advocate for an alternative and more confessional mode of engagement in public debate.